Merits Bariatric 3-in-1 Commode with fixed arms is height adjustable from 16.5” to 22.5” and has a weight capacity of 650-pounds. The frame is made of extra durable steel tubing. Armrest provide comfort and stability. 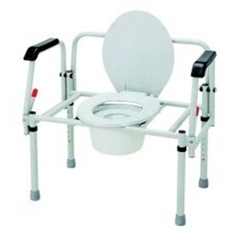 Comes with commode bucket and cover.